The following sermon was preached on August 19, 2018, being the Thirteenth Sunday after Pentecost, at the 8:30am and 11:00am Rite II and 6:00pm Rite I services at the Episcopal Church of the Ascension in Lafayette, Louisiana. Collect: Almighty God, You have given Your only Son to be for us a sacrifice for sin, and also an example of godly life: Give us grace to receive faithfully the fruits of His redeeming work, and to follow daily in the blessed steps of His most holy life; through Jesus Christ Your Son our Lord, who lives and reigns with You and the Holy Spirit, one God, now and for ever. Amen. The blunt, graphic, physical language is intentional. It’s to get our attention, to orient our ears to Christ Himself. “This is a hard saying; who can listen to it?” (John 6.61) Jesus beckons us to listen, for from His words we “understand what the will of the Lord is.” (Ephesians 5.17) His will is not to condemn but to save us from Satan’s power. To those who trust Jesus is given the gift of eternal life, as Jesus was, is, and ever shall be through God the Father. These words contextualize Jesus’ life, His blessed Passion and precious death, His mighty resurrection and glorious ascension. Jesus is our mightiest defense and Source on which our lives depend. And our partaking of Jesus’ Body and Blood in the Eucharist strengthens our union with Him, making us heirs, through hope, of His everlasting Kingdom. Christ’s Body and Blood He offers to all the world. 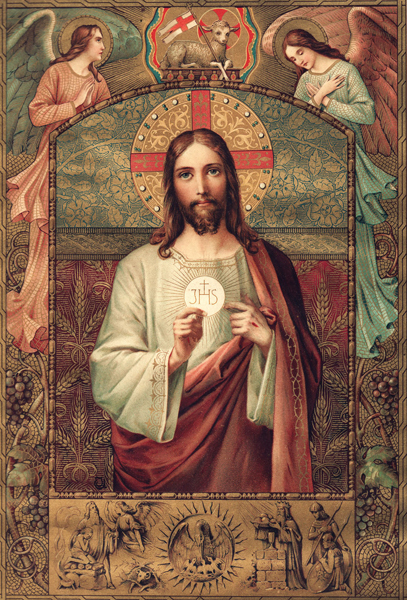 “This is My Body, which is given for you…This is My Blood of the new Covenant…shed for you and for many for the forgiveness of sins.” To feast on Jesus Christ is to be nourished in eternal life. Thus, as Paul says in Romans, we have been “buried…with [Christ] by baptism into death, so that as Christ was raised from the dead by the glory of the Father, we too might walk in newness of life.” (Romans 6.4) From baptism, Christ sustains us through His Word and Blessed Sacrament. Christ’s food is the forgiveness and redemption of His people. All who come to Jesus will never hunger nor thirst. That is because Jesus is truly present in the Eucharist. He has promised, “I am with you always, to the close of the age.” (Matthew 28.20) He also says, “The words I have spoken to you are Spirit and life.” (John 6.63) Jesus’ words, even the hardest sayings, get right to the very heart of the matter—our need for Him who does more for us than we can ever do for ourselves. They are perfect and sufficient, full of grace and the map to eternal life. We can, with complete confidence, draw near and confess Him to be “the Christ, the Son of the living God” (Matthew 16.16) and be changed. “Choose…whom you will serve,” (Joshua 24.15) Joshua said to Israel. As for me, I choose Jesus! There is the old proverbial phrase, “You are what you eat.” In the Word and Body and Blood of Christ is a commission: to be His Body that goes out into the world loving and serving others just as Jesus literally loves and helps us still. That is the nature of Christ’s Body and Blood—to do His will on this earth. In the Bread and Wine, Christ’s Body and Blood, dwells God’s kingdom of grace and eternal life. We are not worthy to receive Him, but Jesus, from the goodness of His grace, still offers Himself to us. And in partaking that which Jesus offers, His Body and Soul, Humanity and Divinity washes our sinful bodies and souls clean. We become what we eat and drink—the Body of Christ, incorporated members of His eternal Kingdom. So, come! Come to the Lamb of God, go to Him who takes away the sins of the world. Blessed are all who come to the Supper of the Lamb. The Book of Common Prayer (1979), pp. 337-338, 364-365. Frank Weston. “Christ in the Sacrament and in the Slum.” Love’s Redeeming Work: The Anglican Quest for Holiness (Oxford University Press, 2001), pp. 561-562. “Now My Tongue the Mystery Telling,” attributed to Thomas Aquinas (c. 1225-1274), Hymnal 1982 (#331).